Astana, corner of Kenesary with Adolf Yanushkevitch str. 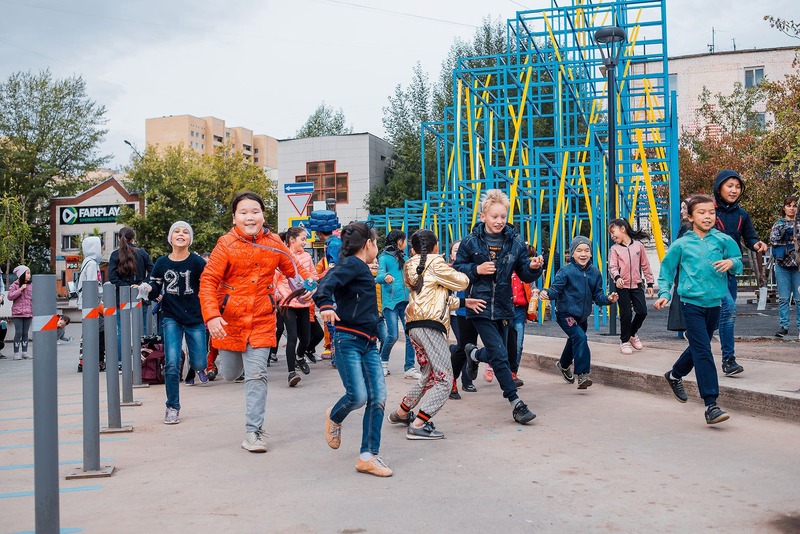 Astana, a twenty years long dreamed project of a metropolis built in the middle of the steppe is entering in a new phase of it’s development. After years of building public iconic objects designed both by local offices and international star-architects in order to establish international visibility and create a feeling of grandeur of a new capital, it starts to rethink public investments. 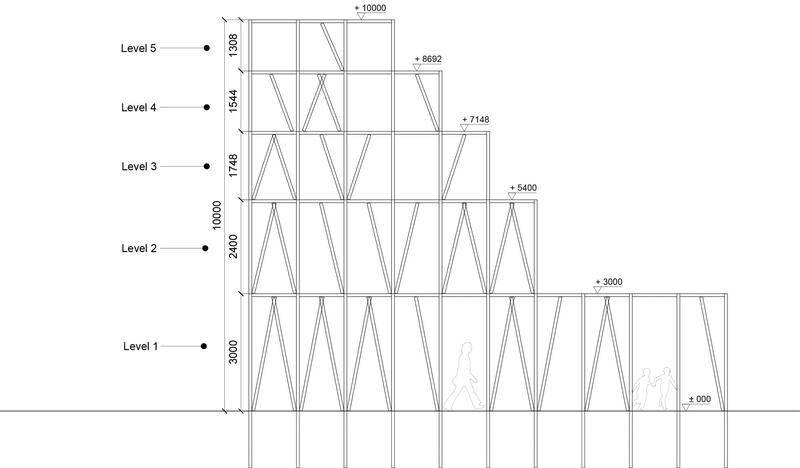 New infrastructures are emerging- from bus-stops and bike-rental systems to pedestrian bridges and public spaces. 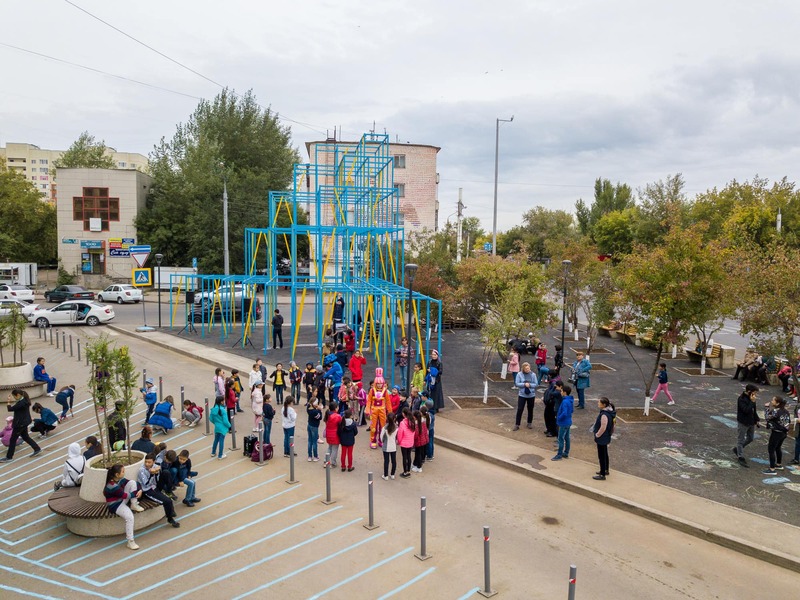 As an effect of a set of conversations on future of Astana’s society with Askhat Saduov, a young yet influential part of Genplan- citie’s planning office, we were asked to propose a new type public space. We chose a place where representation of the new Kazach middle class was not the theme, because local social context was different. 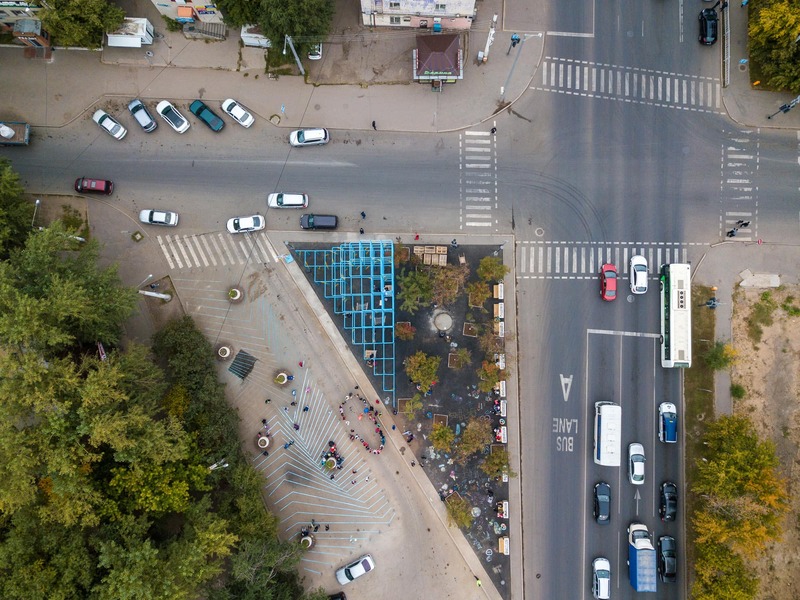 In the old part of the city named Celinograd, on the verge of the university campus and working class Khrushtchovkas we’ve found an intresting triangular left-over of two overlapping urban grids. 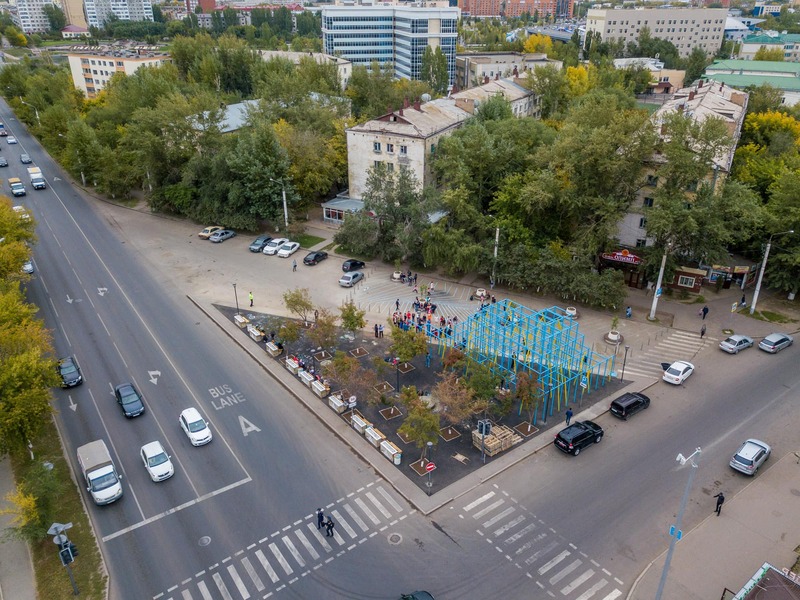 The plot remained empty and unused even though it is placed on the crossing of two important streets, especially Kenesary, that leads to the bridge linking Celinograd with new Astana. 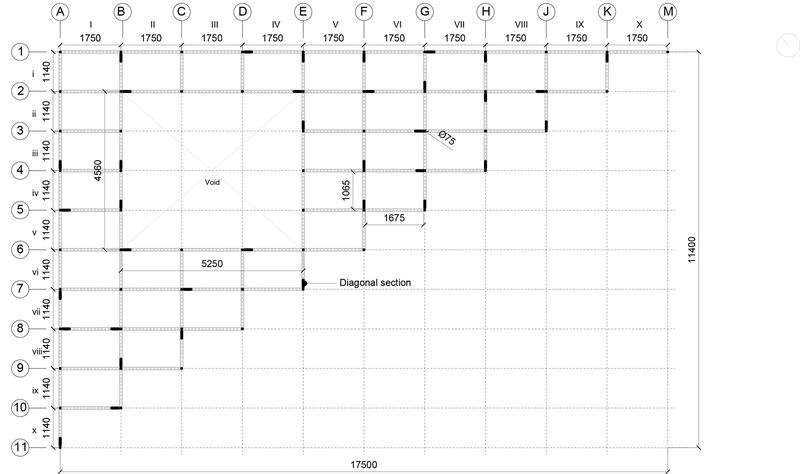 The placement of the installation is in deep contrast with the representation-obsessed new city. 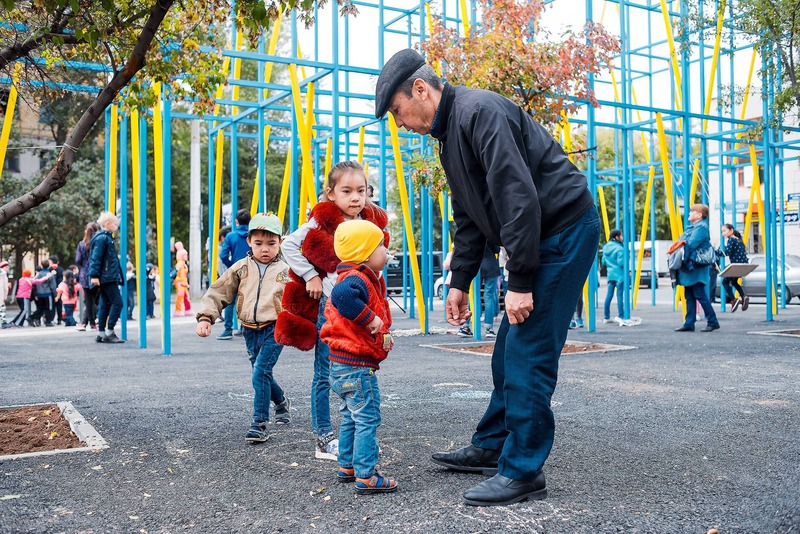 Surrounded by prefab multifamily buildings from 60-ties, betting parlors from 90-ties and empty lots for future development it is a symbolic underbelly of president Nazarbayev’s and Kishio Kurokawa dream project inhabited by the people who actually build it with the proper hands. 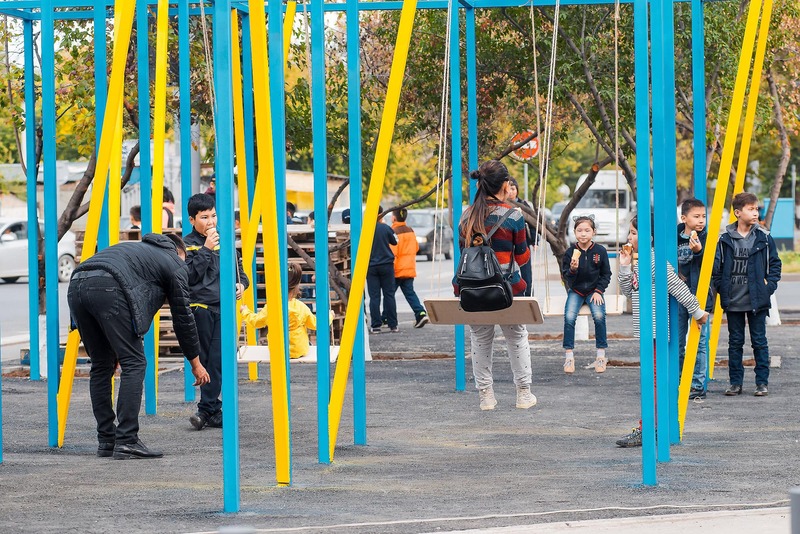 Along with Askhat we decided we would provide a space that people can interpret, not just where they have pre-programmed stereotypal apparata of representation-bound parks. A limited budget and the rug-beating hanger in front of our office placed in a middle of coop housing in Warsaw, drove us towards the idea of a frame to which people can attach their things: hammocks, swings, ropes, planks of wood, etc. 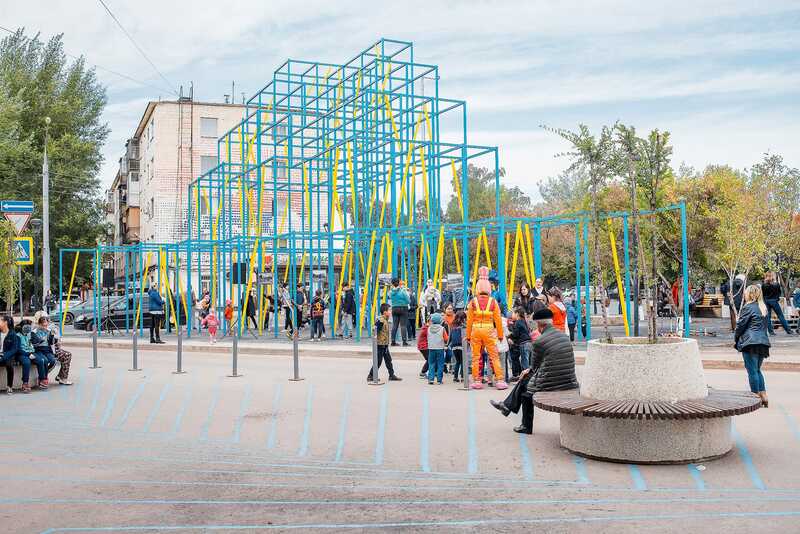 The location called for large scale in height, so the installation would attract people living in the entire neighborhood, not only the inhabitants of the surrounding buildings. The colours chosen came from the bi-colored Kazach flag, a set of blue and yellow that everybody there would find familiar. This was also motivated by our question marks: would people want and know how to use our installation, how not to damage it, how to treat it as their own? 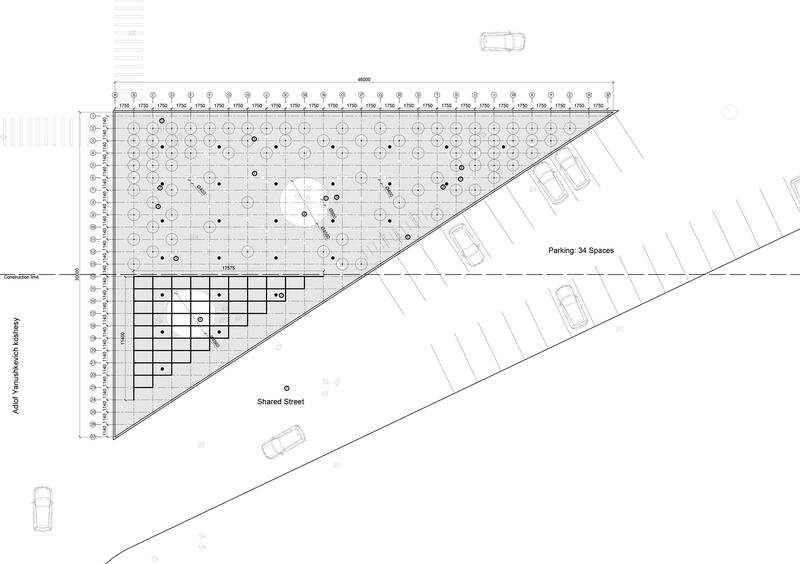 Paralelly to enisaging the installation within a triangular part of the lot, we were asked to plan the entire space, again, taking under consideration a very limited budget. 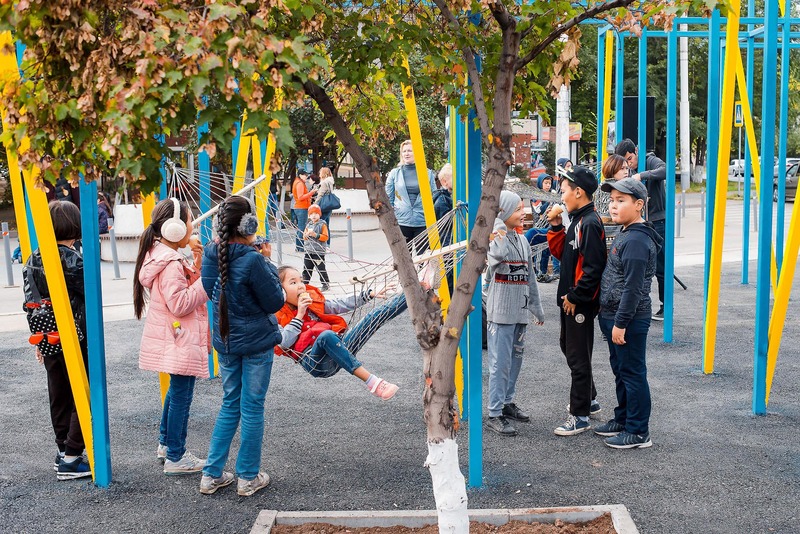 Our observation was that in harsh conditions of continental climate of the steppe, people choose shadowed spaces during hot summers in order to relax sitting under trees and playing chess, one of the favorite passe-temps in Kazachstan. We decided to mimic that sort of feeling of using informal spaces by planting local trees and adding simple benches. 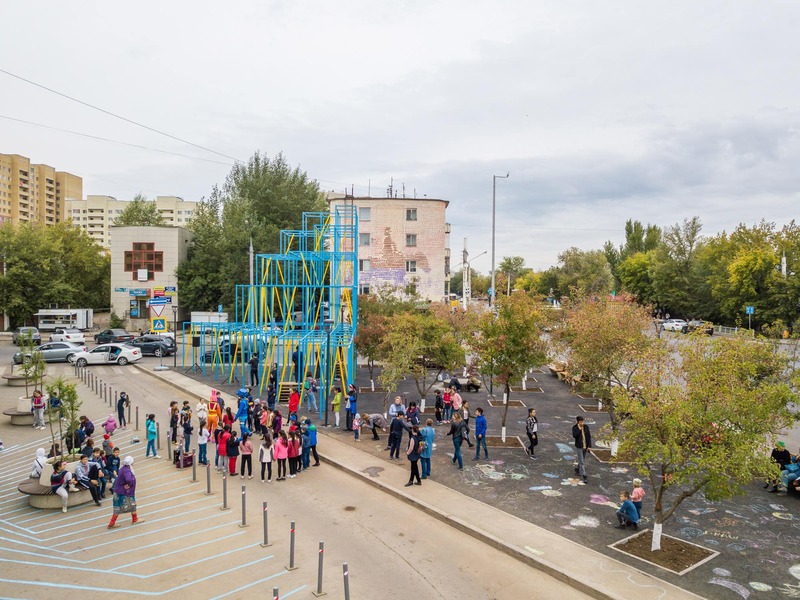 The budget allowed for black asphalt that became a perfect background for chalk drawings and class-games for children. 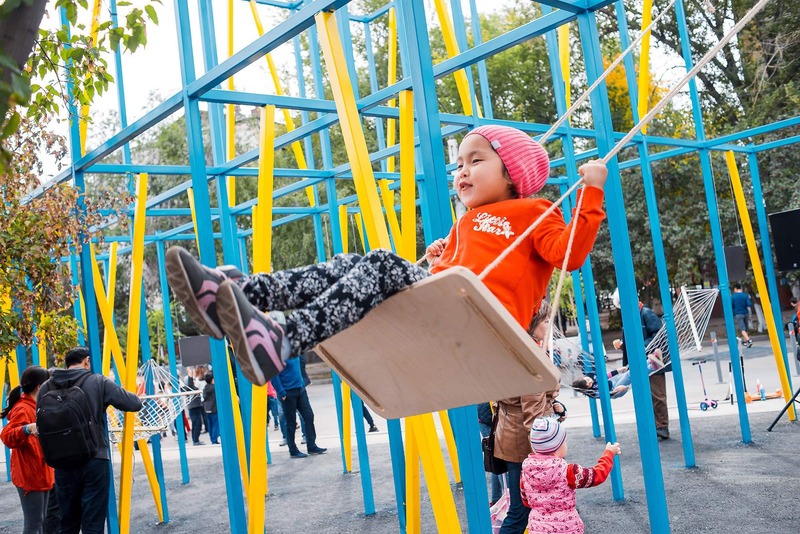 The day of the opening planned with help of activists from Almaty-based festival ArtbatFest proved that people needed this sort of space and that our approach made sense- all ages found their space for activity there.